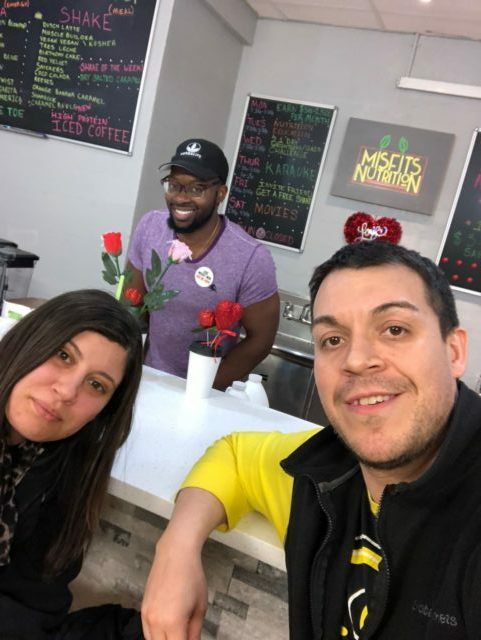 So for months I’ve been connected with the owner of Misfits Nutrition, Anthony. I’ve been meaning to get myself over there to try out his work. 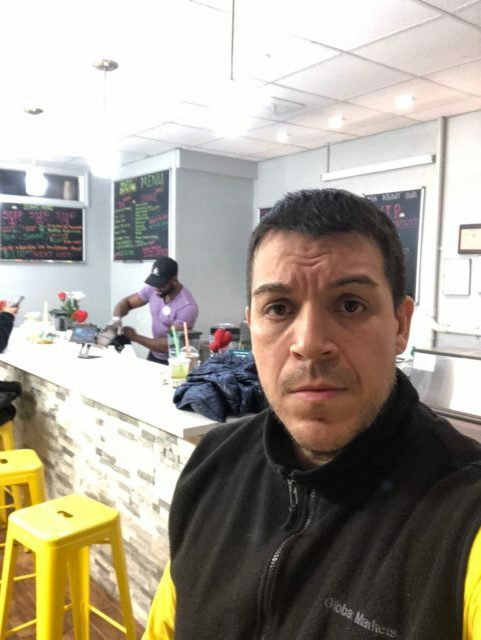 I thought it was extremely clever that he took the herbalife brand, something that I’d have never paid attention to on it’s own, and combined that with the juice bar concept. That right there caught my attention. I thought it was an extremely concept utilizing his herbalife business, genius. Anthony is a very physically fit, friendly and kind man. I stopped by, no introductions necessary as we recognized each other from social media, and I ordered four items, two for me and two for the lady. The way it works if you can get one tea and one shake for $10. So I got some for both of us. Truth be told though, I kind of drank both teas myself, but we’ll get to that. So if you know me and my history, you know that I tend to avoid caffeine products because of my years of abusing thermogenics. 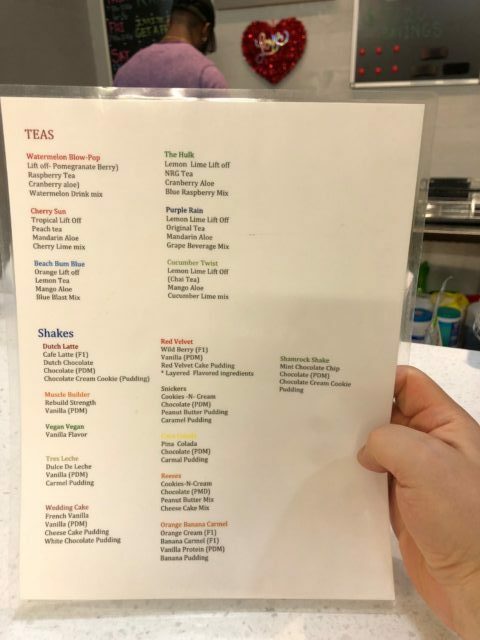 However, I was feeling kind of rebellious, and those damn teas looked really freaking delicious, so I went ahead and had some. I was right, the tea was delicious, and though I only drank one cup, it should be noted that I experienced no headaches, withdrawals, nausea, etc. I was and am perfectly fine thus far. I even drank my wife’s leftover half of tea, and once again, no issues. Perhaps my caffeine addiction problem has improved, or their dose is not enough to become habit forming or cause withdrawals. If you are unclear, read the prior linked article. I explain it all there and don’t feel like writing that crap again. The shakes were also pretty good. They tasted slightly less sweet than the shakes I would get at the juice bar at 24, but I think that is because 24 used a lot more ingredients, some of which I’m not entirely sure qualify as healthy. Oh oh! The shakes I make at home or get elsewhere never taste as sweet as the 24 hour ones. I bet that it’s because of the crack like chocolahalic’s choice that they used to put in there. Without that, it just isn’t the same. But my saying that it’s different is not a bad thing. I mean a milk shake tastes way sweeter than a protein shake, but which of the two are you drinking? Exactly! In any case, this was a good shake, nice flavor, it was icy and kept nice and cold until I brought it home to the Mrs several hours later. I’m actually starting to crave some more talking about it! The space is really cool and welcoming. I sat there as if I was at a local pub, shooting the breeze with Anthony and my new friend Erica. We spoke about business, training, cardio dance fitness and zumba, and just kicked it. I think it’s really cool to get that bar feel, without having to get smashed or being in a bar. The space is all about positivity, there is music and videos playing, and get this, on thursday’s they do karaoke! I think this week after I teach my class I’m coming over to sing. 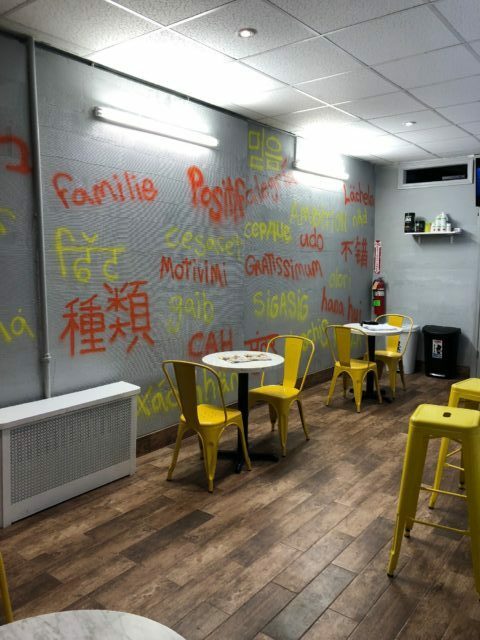 The location is relatively close to the Kew Gardens 24 Hour Fitness, only a few short blocks away. 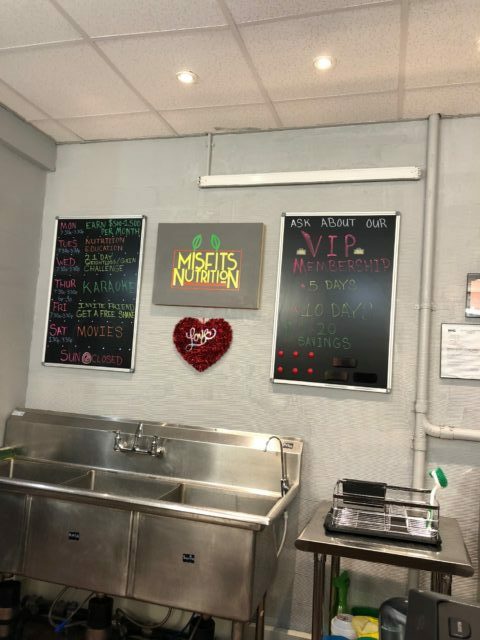 We lost our juice bar some months ago at the gym, but Misfits Nutrition has stepped in to fill the void! I’d encourage you folks to come and give it a try, you can meet a really cool owner, possibly some fellow customers, and get yourself a delicious tea and shake! And if you come Thursday, you can sing too! Jump on over and give them a try!